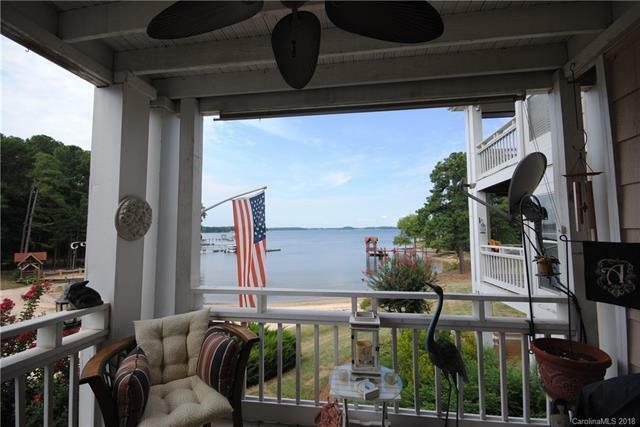 Gorgeous views of Lake Norman from your balcony! Residents of Half Moon Bay enjoy a pool, day dock, sandy beach, community garden, sits next to a marina, picnic tables, volleyball court, walking trails. Close to Robbins Park, Birkdale Village Shopping, Jetton Park. Kitchen updated: blonde cabinets, long handle hardware for cabinets, 5 burner gas cooktop, high quality & neutral colored granite countertops. Tile floor in all areas except bedrooms, guest bathroom full updated with tile shower with seamless door, gas log fireplace in great room area. In both bedrooms: Closets upfitted with white organizer system shelving, racks, shoe storagE. Plantation shutters, neutral carpet, ceiling fans in both bedrooms. Nearby Morningstar Marina offers wet slips & dry storage for boats. Water heater replaced in 2014, upgraded HVAC in 2013 (replaced evaporator coil, circuit board, outdoor condenser unit, programmable thermostat). $2000 for PAINTING ALLOWANCE OR $2000 for CLOSING COSTS offered.